…..World-first discovery by ANZRAG team…. Glaucoma is the second most prevalent cause of blindness in the world (WHO) and can, in most cases, be prevented if those at high risk of developing the disease are identified and treated appropriately at an early stage. Many people at high risk of developing glaucoma are asymptomatic in the early stages, and so are not diagnosed until irreversible vision loss has occurred. 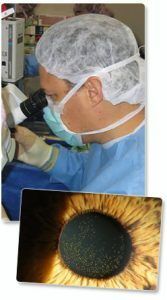 The Australian and New Zealand Registry of Advanced Glaucoma,established by Flinders University’s Professor Jamie Craig, aims to provide the world’s largest collection of advanced glaucoma cases, along with clinical information and DNA, to ascertain new, genetic glaucoma risk profiles. Better identification of those people at high risk of glaucoma, through genetic screening, would result in an overall reduction of preventable blindness by treating the condition before serious sight loss has occurred.